Play directly with your internet bank, no registration required! 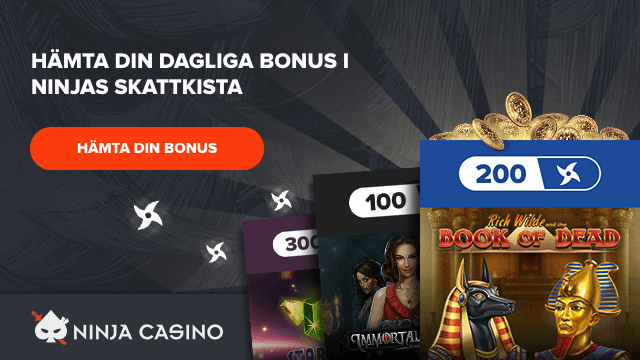 Ninja Casino offers the perfect bonus for all players who love to play for free. Up to 250 free spins are handed out to players every day, without any need for bonus codes or the collection of loyalty points. The only thing needed to activate the Ninja Casino bonuses is one or two deposits made any time during the day. No more, no less. There is no limit as to how many times a player can be rewarded through Ninja Casino bonuses, so the opportunity for free spins is always open. Use the free spins to play on some of the most popular games available and have the chance to win 100 times over, every day. At Ninja Casino, the gaming experience is designed to be as simple and fun as possible. There is no need for registration before gaming can commence, no username or password needs to be remembered and there are no hidden agendas when it comes to bonuses. With just a few simple steps, your balance could be filled with free spins to spend on a number of Ninja Casino’s popular slots. The bonus is, of course, available to every player no matter if his or her game console of choice is a mobile phone, computer or tablet. When a player has been rewarded with their free spins they have 24 hours to use them before they become invalid. Considering that the free spins are credited directly after an approved deposit and the games available for free spins are some of the most popular games on today’s market, the time restriction should not be a problem. Ninja Casino’s free spins can be used on some of the most popular games offered at ninjacasino.com. No download or extra registration is needed to play, as the games are only a click away on the casino website. Every 24 hours, the campaign game is replaced with a new one so it’s best to visit ninjacasino.com bonus page regularly to make sure you don’t miss an opportunity to play your favourite game for free. Ninja casino free spins can be used on games like Koi Princess, Jade Magician, Ninja Fruits and Starburst, among many others. Koi Princess is one of NetEnt’s latest inventions, an Asian inspired game jam-packed with exciting bonus features. Jade Magician is a new arrival at Ninja Casino and combines good graphics with one of the best offers in online gaming – the game promises to double all winnings. Ninja Fruits takes its name and inspiration from the popular mobile game. For players looking for bright colours and tonnes of fruit, this is the game for you. Starburst is possibly the most popular slot game on the market today. Thousands upon thousands of players enjoy this slot every day, which with its blossoming flower offers big winnings with every game.